Does zucchini bread land on your list of daily vegetables? Is the peanut butter in a Reese’s cup your afternoon dose of protein? Find out how good you are at counting calories with these nurse-favorite break room treats and vending machine snacks. How many calories are in one Little Debbie fudge brownie? How many calories are in a Starbucks zucchini walnut muffin? How many calories are in one Entenmann’s Rich Frosted Donut? 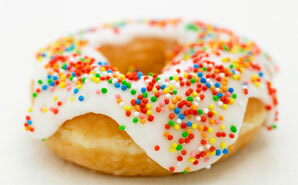 How many calories are in one Krispy Kreme Chocolate Iced Donut with Sprinkles? How many calories are in one slice of Domino’s Hand Tossed Pepperoni Pizza? How many calories are nestled in one Nestle Toll House chocolate chip cookie? How many calories are in one Kellogg’s frosted blueberry Pop-Tart? How many calories are in a Snicker’s bar? How many calories are in one package of Reese’s peanut butter cups? How many calories are in one 12-ounce can of Coke Classic?